Anyone who’s seen the ads on TV encouraging you to buy gold might be under the impression that gold attracts a particular kind of person: someone with a pessimistic outlook on the global economy, they may have a certain kind of politics, and they definitely don’t trust the banking system. 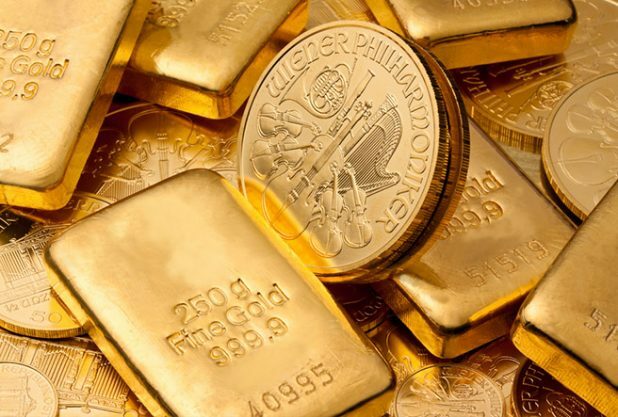 While gold does offer an appealing investment for anyone who expects a monetary crisis is right around the corner, there are plenty of good reasons for your everyday investor to own a bit of gold bullion. Here are just a few of the reasons an everyday investor should consider putting their money in gold. Diversification is the name of the game with modern portfolio management and it’s one of the best reasons to invest in gold right now. The average portfolio will mostly be composed of stocks and bonds, whether you’ve bought them directly or through a mutual fund. Since gold prices were left to float freely on the markets, gold and the stock markets have largely had an inverse relationship. That means gold usually doesn’t perform well when stock markets are going up, and stock market crashes are great for gold prices. Given the cyclical nature of the stock market and its historic levels right now, shakiness on the market has some investors shoring up with gold. Balancing your stocks with gold can help you mitigate your losses during recessions and market downturns. You can even use your gold gains to invest in more stocks at low prices, and vice versa. Putting about 10 to 20% of your portfolio in gold will make a real difference during market downturns. Just like the stock market, gold typically has an inverse relationship to the U.S. dollar. As growth picks up, inflation does too, and that can erode the value of cash. Gold is often considered an inflation hedge, as it has a historic track record of rising value compared to the dollar’s gradual decline. Gold isn’t just an inflation hedge, it’s also a bet against the general value of the dollar. As U.S. debt increases (hitting a historic $22 trillion in February 2019), investors lose confidence in the dollar. Demand for gold comes from several sources: the jewelry industry, central banks, investors, and technology & manufacturing. Developing world countries have lately become big customers of gold. As people in both China and India enjoy greater spending more, many are sticking to traditional gold investments like gold jewelry, and that has the potential to cause a real supply shortage. If these sound like good reasons to you, you can learn more at Silver Gold Bull about how to buy gold and manage your gold investments. They are an online gold and silver retailer that makes it easy to buy investment-grade gold. Physical gold bullion like gold coins and gold bars are the safest way to invest in gold long-term. Coins like the American Gold Eagle and Canadian Gold Maple Leaf are generally the most effective ways to invest in gold coins in North America. Gold bars can often be purchased at even lower premiums, though gold coins often come with more advanced features for confirming their authenticity – especially the Canadian Gold Maple Leaf. As economic growth looks poised to slow down, try investing in gold today.